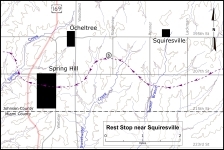 Heading for Spring Hill, Kansas, Quantrill halted once again to rest just west of the small town of Squiresville, Kansas. Looking north from Rest Stop near Squiresville tour stop. Looking south from Rest Stop near Squiresville tour stop. Map showing location of the Rest Stop near Squiresville tour stop. Click on thumbnail to load high resolution version of the map.